A very clever mouse takes a stroll through the deep dark forest. 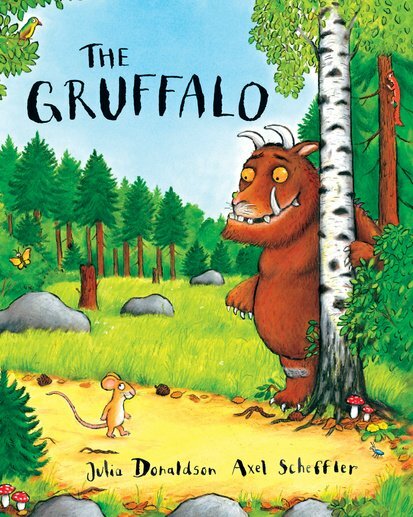 He encounters many dangerous animals along the way, so to scare them off he decides to invent a story about a frightening creature named the Gruffalo. Imagine his surprise when he meets a real Gruffalo! The Gruffalo is a classic children’s book that is great fun to read aloud thanks to its short rhymes and repetitive structure. The colourful illustrations and exciting story plot will keep children interested to see how the clever mouse will outsmart his predators each time. This book can be used to work on many speech and language goals. I love how the little mouse carefully describes each part of the Gruffalo, from his terrible claws to the poisonous wart at the end of his nose! The setting description is repeated several times throughout the story, and the clear sequence of events makes it an ideal choice for targeting children’s sequencing skills. For further speech and language targets in The Gruffalo, see list below.